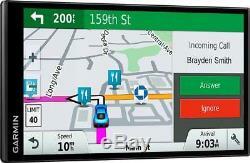 Garmin - DriveSmart 61 LMT-S 6.95 GPS with Built-In Bluetooth, Lifetime Map Updates and Lifetime Traffic Updates - Black. Preloaded base map coverage of North America; 6.95 touch-screen display; lifetime traffic updates; lifetime map updates; hands-free calling via Bluetooth; Wi-Fi; highway lane assist with junction view. Stay connected behind the wheel with Garmin DriveSmart, the navigator that features a collection of smart features in addition to helpful driver alerts and easy-to-follow directions. From hands-free calling and live traffic information to built-in Wi-Fi and more - the future is on your Garmin. Just look ahead and drive. Update your maps for free The pre-loaded maps of North America can always be updated for free. 6.95 color touch screen offers a clear view The large screen makes it simple to enter destinations and navigate functions and settings. Lane assistance keeps you ready for the next turn Colorful arrows tell you which lane to be in to make your next exit or turn. Customize your route options You can set up three alternate routes so you're prepared to take advantage of the road ahead. Connect your unit using USB interface Easily connect to your computer, smartphone or car charger to get map updates, access real-time traffic and more. Bluetooth technology Allows you to pair with compatible devices, so you can enjoy hands-free calling in your vehicle. Lifetime traffic extends for the useful life of your Garmin traffic receiver (as long as you own a compatible Garmin GPS) or as long as Garmin receives traffic data from its traffic supplier, whichever is shorter. 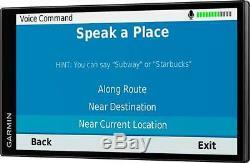 DriveSmart 61 LMT-S 6.95 GPS with Built-In Bluetooth, Lifetime Map Updates and Lifetime Traffic Updates. Prices and offers are subject to change. The item "Garmin DriveSmart 61 LMT-S 6.95 GPS with Built-In Bluetooth, Lifetime Map" is in sale since Saturday, November 25, 2017. This item is in the category "Consumer Electronics\Vehicle Electronics & GPS\GPS Units". The seller is "best_buy" and is located in Multiple Locations, BestBuy Warehouses.